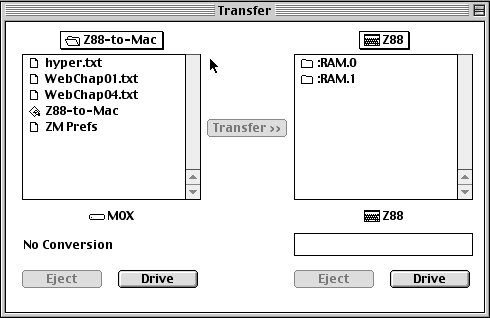 Mac Link allows you to transfer and convert files in both directions from a Z88 to a Macintosh Plus, Macintosh SE or Macintosh II (as well as the later models). Files are saved as ASCII, or translated into MacWrite files which are accepted by Microsoft Word, Word Perfect, WriteNow, Fullwrite Professional and Lotus 1-2-3, and can be imported into Pagemaker, Quark Xpress and Ready Set Go! Supplied with the Mac Link ROM (32K EPROM pack),a 3�" disk, a 9-to-8 pin min DIN cable and user manual. Some Mac users have found they are unable to read files on the disk with the latest machines. This download is version 1.1 of the Z88-to-Mac program for transferring files from your Z88 to your Mac. To use it you will need the Z88 to Mac ROM installed in your Z88, as well as a Mac link cable. It is a Classic Mac program, so will run on both Mac OS 7.x to 9.x as well as running in OS X under the Classic environment. ( Z88-to-Mac.smi.sea) of a self-mounting image (.smi). If this doesn't work, try download the enclosed zip file with Z88-to-Mac.sit enclosed. After downloading it, simply double-click the file and it will automatically decompress itself and mount on the desktop. Once it has mounted, drag the program to your hard drive to install it. For help on how to use the program, please consult the manual that came with the ROM. Carry on using your MAC Link with the latest MAC with this serial adapter. Comes complete with USB Device cable, Mac Driver CD, and user guide. When you order this from us, you get the MAC Link FREE! Download the latest drivers now. The first step is to install the Keyspan serial adapter drivers. These should be on the CD that came with the adapter. You can also find them on the Keyspan web site (the web site's version of the file may be more recent than the one included on your CD). To install the drivers from the CD, simply double-click the Install Keyspan USA28X file and follow the instructions. If you have downloaded the updated drivers from the Internet, you must first decompress the Stuffit archive that they came in. If you don't have Stuffit Expander (it should have been installed when your Mac OS was installed), you can get it from the Aladdin Systems site. Once you have decompressed the archive, you can double-click the file and follow the instructions. Open the Control Panels folder by selecting Control Panels from the Apple menu. Open Keyspan Serial Assistant by double-clicking the Keyspan Serial Assistant Control Panel. The Keyspan Serial Assistant opens and shows you its current status. 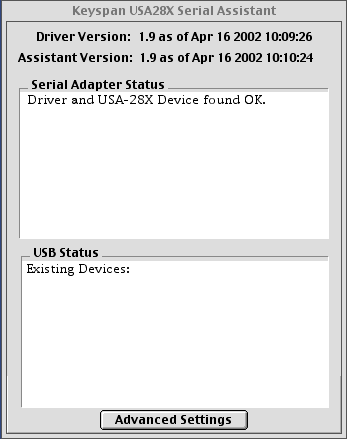 If you do not see Driver and USA-28X Device found OK, you should consult your Keyspan adapter manual under Troubleshooting. 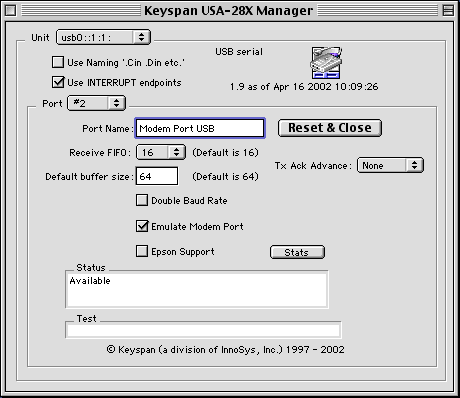 To configure your adapter's ports for connecting to your Z88, open the Keyspan USA-28X Manager by clicking the Advanced Settings button. Select #2 in the Port drop-down list, as this is the port that emulates the modem port on the adapter. Z88-to-Mac was programmed to connect to the modem port on older Macs. As the more recent Macs lack a serial port, the adapter must fool the program into seeing its port as the modem port. Select the Emulate Modem Port option so that the adapter tells Z88-to-Mac that the modem port is available. Reset the adapter and close the serial port by clicking the Reset & Close button. This configures the adapter with your new settings. Close both the Keyspan USA-28x Manager and the Keyspan Serial Assistant. You need to unplug the Keyspan adapter and then plug it back in again, as it reconfigures its ports when it is plugged in. 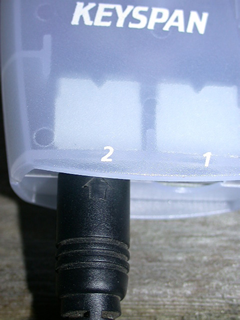 The Keyspan driver is set up to send information to port 2 on the adapter, so plug the Z88 serial cable into the port marked 2 on your adapter. You are now ready to start Z88-to-Mac and transfer your files.